Before the first lecture has finished, you will discover precisely where Man went astray in all previous quests for truth, and gain the overriding viewpoint of an effective Scientologist: looking not inward but outward to the world … and handling others. For this is the Congress that signaled the advance of technology to a breadth of uses across all dynamics and all human problems—from personal to global. Beginning with that “almost mystic” quality of a thetan, the ability to grant life, L. Ron Hubbard lays out application after application of Scientology principles to virtually every type of human activity—from educating youth, to training of workers and even causative means to handle the mounting threat of nuclear weapons. While to provide the means for every Scientologist to make a difference, he unveiled the Personnel Efficiency Course. Describing it as “Man’s brightest hope,” he demonstrates how even a tiny amount of Scientology can transform entire zones of living—rapidly and easily. Here, then, is the definitive Congress on bringing Scientology answers everywhere, including the release of The Problems of Work: Scientology Applied to the Workaday World—and the use of that book by Scientologists to help the everyday worker, to problems of a whole society and the means to revive an entire nation to its previous glory. The main question which, of course, faces Man at this time is, is he going to live long enough to avail himself of this material? And of course that’s all up to a throw of the die, a flip of the coin and other such chances—or perhaps to our own abilities and endeavors. While the Second World War was long over, and more than a decade had passed since England felt the shock of nightly bombings, the debris still remained—not in the streets, but certainly in the minds of its people. So it was that in the autumn of 1956, L. Ron Hubbard set sail for Europe. En route aboard the Queen Elizabeth, he authored a book that said much about what he would bring to Britain and a continent still reeling from the war’s economic devastation. While befitting all else he would bring in the way of new ideas, the venue was a newly constructed Royal Festival Hall in South Bank, London. Its stage bore flags of the twenty nations, one each in representation of the countries from which Scientologists had traveled. 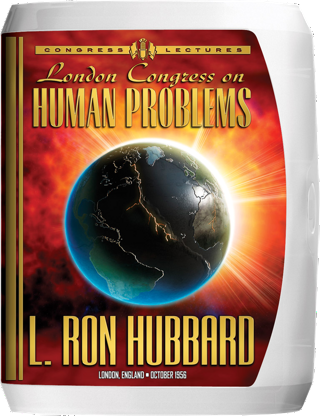 And seated in the aisles were hundreds waiting to see, hear and, with fortune, meet L. Ron Hubbard at this, his first Congress outside America. But this was not just any Congress. For it was the culmination of an intensive year of travel for Mr. Hubbard as well. Unbeknownst to most of the Scientology world and in between all else he was doing—continuing his research, training of auditors and lecturing at Congresses in Phoenix and Washington, DC—he had also established a remote Scientology outpost in Dublin, Ireland. It was specifically chosen by him as an area of the world where Scientology was as yet unknown and all for the purpose of developing and testing new technology for broad scale application. Even more specifically, the center served as a base to refine administrative procedures so this basic technology could be effectively and successfully disseminated by any Scientologist in their own zone. To just that end, Dublin was also a city not yet familiar with the name L Ron Hubbard and so, as he pointed out, its success in no way depended on his own fame—thus proving it could be repeated anywhere. With that research project as a backdrop, the Congress began with something entirely different: A presentation by six distinguished speakers including a biophysicist, an actor of radio, television and stage, an educator, a company director, the president of the British Sales Promotion Association and a final address by an archbishop speaking on the many problems he confronted in carrying out missionary activities across the world. 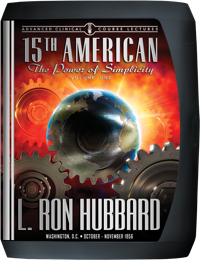 Whereupon, on October 5, L. Ron Hubbard himself took the stage for his monumental opening lecture: “Man’s Relentless Search.” What followed was a sweeping look at the seemingly insurmountable problems faced by humanity and how each surrenders to the simplest of Scientology principles. From the education of children to reducing crime, from handling the workplace to resolving escalating international conflicts—here was the call for Scientology to assume its role on the global stage. And so came his announcement of the means by which Scientologists everywhere could accomplish that task with the unveiling of the results of his Dublin Center and what he otherwise described as “Man’s brightest broad hope”: The Personnel Efficiency Course. It incorporated the recently published Scientology: The Fundamentals of Thought and the specific manner in which it could be taught. But there was also something more—the book he’d authored en route, providing the senior principles and laws which apply to every endeavor, discoveries that explain the very fabric of life itself: The Problems of Work: Scientology Applied to the Workaday World. Yet Mr. Hubbard still wasn’t done. For while the Personnel Efficiency Course gave the means for grassroots level application, he next took it to the top planetary view, providing the Scientology solutions to both halt those forces destructive to Man’s future and the means to revitalize an entire nation. To just that end, Congress delegates voted to petition world leaders and bring two critical matters to government agendas: first, to fully investigate the so-called field of healing; and second, halt the unrestricted release of radiation into the atmosphere. So it began—Scientologists stepping to the forefront as global problem-solvers.